Turkey’s local elections — for mayor, municipal councils, and neighborhood representatives — will be held on March 31. At this point, with Turkey’s deepening process of fascization, every election is treated as a referendum on President Recep Tayyip Erdoğan’s rule, and discontent is brewing in broad swaths of society. The main societal issue these days is the economy. While the economy’s structural weaknesses erupted into open crisis some time ago, the regime has not been able to maneuver the country out of the doldrums, providing only palliative solutions to the worst woes. Most visibly to the majority of the population, the country is plagued by an annual inflation rate of 20.3 percent. The inflation rate of basic consumer goods is even higher. And although the regime tried to present the economic crisis — particularly the currency shock last August, which saw a rapid devaluation of the Turkish lira — as an “assault” by “foreign forces,” this line of argument has been losing its persuasive power. People are, quite literally, hungry, and although many were willing to put up with the dire situation for some time — especially supporters of Erdoğan’s Justice and Development Party (AKP) — the constant assertions that “the worst is behind us” are starting to ring hollow. The most recent move to alleviate discontent in the run up to the elections came last month, when municipalities issued decrees for the sale of cheap vegetables and fruits in Istanbul and Ankara, the country’s two most crowded cities. Tents were set up, and people lined up for hours to get onions, potatoes, tomatoes, and other basic food items for half the market price. In previous years, President Erdoğan had frequently boasted that in the “old Turkey” — that is, before the AKP came to power — people had to stand in line for hours to get food, gas, or similar basic needs. Now it’s his regime that is forcing people to queue up for the rudiments of life. And elections are right around the corner. In order to understand the current economic crisis, we have to take a broader look at the Turkish model and the economy during the AKP years. When it won office in 2002, the AKP inherited the structural adjustment program that its predecessor had enacted in conjunction with the International Monetary Fund (IMF): austerity coupled with a massive wave of privatizations. The party faithfully carried out the measures, the “independent” central bank enforced a tight monetary policy, and a series of additional neoliberal reforms were put in place (an end to agricultural subsidies, deregulation of industrial sectors, job cuts in the public sector). The steps pulled the Turkish economy out of crisis, restructuring it and reintegrating it into the transatlantic capitalist order. As a result, it was able to profit from capital inflows in the 2000s just like other “emerging market economies.” Turkey was offering higher interest and profit rates at stable and predictable conditions. Institutionalizing neoliberalism, it seemed, had paid off. Yet there were structural downsides. Typical for an economy of its kind — on the periphery of the world economy, enforcing an export-oriented neoliberal policy — Turkey suffered from foreign dependence, relying on imports of capital and intermediate goods, and money capital in various forms. Industrial investment lagged, and competitiveness was secured on the basis of depressed wages and a repressive (often deadly) labor regime. The dependence on imports produced chronic current account deficits. Given the low level of domestic savings, the country counted on foreign capital flows to finance its deficits (and privatizations). In addition, the availability of cheap foreign capital made credit-driven expansion of business more attractive, particularly after the AKP lifted restrictions on the latter in 2009. The expansion mainly benefited sectors like construction and eventually led to oversaturation of the market. Debt in the private sector — especially in the portion of it denominated in foreign currency — soared. Household debt soared as well, as stagnating real wages — labor’s share of the economic pie has fallen by 15 percent in the AKP era — were compensated with an enormous boost in consumer credit. Another problem with Turkey’s structural dependence on foreign flows is that it made the economy extremely vulnerable to external shocks — like the 2007–8 crash, followed by a second round in the periphery starting from 2013. The economic instability in 2013 was not only triggered by Turkey’s domestic political crisis — which we have chronicled at length in Jacobin — but also by the end of the era of cheap liquidity as the Federal Reserve announced it would start raising the US interest rate. One result of this was that capital parked in the periphery would either flow back to the US or demand a much higher interest rate to stay put. Consequently, Turkey started to lose its relative attractiveness for international capital. Short-term investments, and credits in particular, responded nervously to the increasing instability. The devaluation of the Turkish lira, along with other economic maladies, thus already began in 2013 (not in 2018, as mainstream economy journals would have it). This led to a further increase in foreign debt in local currency terms, particularly of the private sector. Typically, one would expect that currency devaluation would favor the trade balance. Yet, the eurozone crisis and other foreign policy issues (Russia, Syria, Iraq) produced a contraction of foreign markets, and exports stuttered. The tourism industry and other sectors grew oversaturated thanks to cheap credit, recording oscillations and then slumps. To put all of this in a nutshell: the extreme fragility of the Turkish economy since 2013 has been the result of structural factors (the country’s position in the global division of labor and dependency on imports and foreign capital flows) as well as the AKP government’s devotion to neoliberal policies, however unorthodox. Erdoğan and the AKP have tried to calm the economic storm through a variety of means. In the political sphere, they’re on a warpath to mobilize the public against various internal and external “enemies” (the Gezi Uprising, Rojava, the Kurds since 2015, the “Gülen clique” since the 2016 coup, occasionally the Syrian regime, Russia, the US, and a number of EU countries). 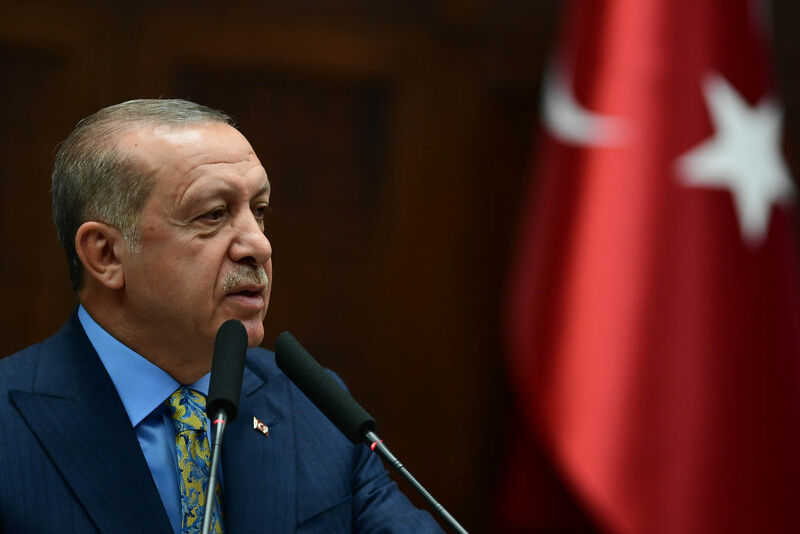 In the economic realm, especially since 2015 —which witnessed three general elections, a constitutional referendum that bolstered Erdogan’s power, and finally the presidential election itself — the government has tried everything to avoid or postpone collapse. In April 2018, when it became clear that the current state of affairs was no longer sustainable, Devlet Bahçeli, the leader of the fascist Nationalist Movement Party’s (MHP) and currently Erdoğan’s closest ally, declared that the country “was no longer in a position to hold off until November 2019” — the scheduled date for the presidential and general elections — and called for snap elections. Marred by repression (media censorship, campaign restrictions in favor of the AKP, etc. ), the contest took place on June 24. The first symptoms of the economic collapse had already appeared in May 2018 as the purchasing managers’ index (for manufacturing and service sectors) dropped to the lowest level since 2009 and the lira’s value against the dollar plummeted by more than 10 percent within a couple weeks. Even before the official onset of the “currency crisis” in August 2018, big capital was forced to restructure around $24 billion in debt. For the third time since 2013, the economy found itself in a deep bottleneck — and this time, though the underlying mechanism was the same, the problem was much more severe The economy’s import dependence reproduced the chronic current account deficits, which made foreign capital inflows indispensable and triggered skyrocketing (private) debt. In an economy where the private sector’s debt stock (mostly denominated in foreign currency) is more than 60 percent of the GDP, rapid currency depreciation is just about the worst thing that can happen. As a result of the country’s sensitivity to fluctuations in the exchange rate, the interest rate in Turkey is primarily determined in relation to the exchange (rather than the inflation) rate. Consequently, policymakers find themselves in a deadlock of their own making: Interest hikes necessary to sustain the value of the currency end up harming domestic consumption as well as leading sectors such as construction, which rely on low interest rates. The panic that had set in before the election only grew in its aftermath. The purchasing indices in manufacturing indicated a contraction throughout the summer. The lira dropped by 50 percent against the dollar in the fifty days following the election. While the currency woes seemed to cry out for an interest rate hike, the contradictions in policymaking sharpened. Berat Albayrak — Erdoğan’s son-in-law and his appointee as finance and treasury minister — declared in early July that the central bank would be more active than ever, but it took the institution until September to raise the interest rate. The main reason was Erdoğan’s fierce opposition to a rate hike — he publicly scolded, insulted, and threatened those who favored one. According to mainstream commentators, Erdoğan’s opposition is a product of authoritarianism, incompetence, and irrationality. But Erdoğan’s behavior is nothing but a reflection of the underlying deadlock of the Turkish economy. A higher interest rate would temporarily save the tumbling currency, but it would also trigger a substantial fall in credit-driven consumption, as well as both supply- and demand-side contractions in the most important sectors, such as construction. This would be especially bad for the segments of capital that heavily depend on internal credit-taking — incidentally, the small- and medium- sized enterprises in textile and construction that, together with their employees, form one of the most important parts of the AKP’s social base. There is therefore an underlying rationality to Erdoğan’s attitude, namely that of political survival. Likewise, it’s eminently understandable that Erdoğan and his entourage oppose any IMF agreement. The IMF has been very clear about its preferred solutions to Turkey’s crisis: tight monetary policy, tight bank supervision, complete deregulation of the labor market, severe austerity, high interest rates. Erdoğan knows this would be a political disaster. The turmoil that shook the economy last spring and summer was by no means a surprise. It is the usual outcome of dependent financialization in a peripheral economy — the dominant form that capitalism has taken in the past few decades in countries like Turkey. What, then, were the concrete factors that determined the timing of this “expected shock”? First and foremost, there was the US Federal Reserve’s announcement that it would ease off on its quantitative easing program. For a time, the Fed’s cautiousness in raising interest rates had saved the global periphery from a sudden contraction in liquidity while still putting substantial pressure on these economies, most of which have been slowing down. Turkey, for its part, had already weathered two waves of financial stress, in 2014 and 2016, as a result of the changing international landscape and domestic political conflicts. The latter dimension of the crisis, which stems directly from the integrated structure of global capitalism, should be emphasized against the view that looks for idiosyncratic failures of individual governments, policymakers, and so forth. In addition to the global context, the uncertainties related to the new political system (including economic policymaking) represented significant question marks for international capital. They wanted to make sure the country would keep abiding by the neoliberal paradigm (promising a high rate of return to financial capital and the implementing austerity measures). In fact, as Finance Minister Albayrak was presenting the “new economic model,” the lira hit record lows because it was clear the minister did not have much to say about his new field. Furthermore, the political tensions between the US and Turkey — most famously over Andrew Brunson, the American pastor who until last fall was imprisoned in Turkey for alleged espionage — fanned the flames. The turmoil that started early last summer stretched through the end of the year and — despite Albayrak’s furious claims to the contrary — has worsened in early 2019. The lira has shed more than 40 percent of its value against the dollar, and around 35 percent against the euro since the beginning of 2018. One of the most obvious signs of crisis is the annual inflation rate, which has climbed to over 20 percent. The price increases in goods that the poor and working classes rely on is substantially higher: 25 percent in food and housing, 32 percent in household utensils, and so forth. These figures are also likely understated: the government has apparently adjusted the rate downward as part of its “total battle against the inflation,” which has seen the temporary imposition of price cuts and threats to those who set “artificially high prices.” Supermarkets accused of “price terrorism” have been hit with steep fines. The second important manifestation of crisis is a severe drop in credit volume. Last September, the central bank increased the interest rate by 6.25 percentage points to keep the exchange rate under control and avoid mass bankruptcies. The contraction in the credit market had already started in August, continued as a sharp collapse until November, and today is still hovering at levels way below those of late last summer. In particular, the bleak figures from the construction sector, which accounts for more than 15 percent of aggregate value added in the economy, suggest a recession has already taken hold. With millions of dwellings unsold, the construction industry is on the verge of a crisis that the government — which has touted the industry as central to the country’s success — is anxious to avert. Yet instead of being contained, trouble in construction has bled out to supply sectors as well: ceramics, glass, and cement production shrunk by roughly 21 percent in the final quarter last year. Similarly, drops in investment in so-called “mega-projects” (third Istanbul bridge, Osman Gazi bridge) have set in, as have bankruptcies of companies that were denied a second round of debt restructuring. More bankruptcies are sure to buffet the economy as the effects of the first round of debt restructurings, which took place last summer, peter out. As of October, around three thousand companies had applied for debt restructuring, most of them in the construction sector. The vultures have already appeared on the horizon, just waiting for the bankruptcies to turn into investment opportunities. Erdoğan, not surprisingly, is spooked. According to a reporter close to the government, the president has explicitly demanded that all measures be taken to mollify popular complaints. One those steps is a new regulation allowing businesses to hide the increase on their balance sheets in foreign currency liabilities until 2023. This is an attempt to make sure that tens of thousands of businesses can keep borrowing from the banking sector, rolling over their debt, and thereby postpone going bankrupt. Similar measures are being introduced left and right. Three public banks sharply reduced interest rates for housing credit and began offering cheap credits for restructuring older credits in an attempt to stimulate the industry. The country’s Credit Guarantee Fund has been sponsoring more than half a million businesses in another bid to avoid a sudden drop in debt servicing and a spike in bankruptcies. In other cases, where capitalists very close to the government are threatened, the policies have been even more generous: directly sponsoring enormous credits via the Treasury or providing direct cash assistances and tax exemptions. Stimulus packages have become a regularity, with the government introducing targeted tax reductions or restructuring credit card debts (a substantial source of economic fragility as interest rate for consumption credit have risen to 40 percent). These are a small but representative picture of the government’s frantic efforts to buoy the economy. They all attempt to prevent the bottom from falling out, or more accurately, to postpone the worst developments until after the election. Who Will Pay for the Crisis? One of the main strategies of the government and the bourgeois media has been to depoliticize the crisis by claiming “we’re all in the same boat” — that the country is in “difficult times” and everyone has to unite and overcome the hardship together. All these incentives and slightly expansionary measures put a rising burden on the state — which means that the public will have to pay for the crisis if things go on as they do. When it comes to the working classes, of course, nothing comparable is on the table. The minimum wage for 2019 is set at 2020 lira (approximately $380 per month), which falls below even the hunger threshold for a family of four (2,213 lira, or about $410 per month). At the same time, the tax burden on the lower and lowest income strata keeps rising. In the meantime, news of workers’ resistance and strikes (which the government immediately declares illegal) are streaming in from around the country, especially in the hard-hit construction sector. One of the biggest was organized by construction workers at the new Istanbul Airport, which will be one of the world’s largest. Thousands of laborers stopped work last fall and initiated a protest on the construction site, demanding regular payments, workplace security measures (some workers reported that on average a laborer dies every day in so-called workplace accidents), and decent living conditions (instead of the vermin-ridden dorms they’re currently forced to live in). As usual, the police immediately encircled the construction site, barred the media — and even MPs — from entering, and detained hundreds of workers with the help of military police. It’s clear which side the government is on. After the elections later this month, workers should expect to experience deprivation as severe as 2000–2001 if things go on as they have. On the surface, capital seems to be more united than ever behind the regime and its crisis management. Even non-AKP big capital — as organized in the largest capitalist lobby, TÜSIAD — and some of its member holdings have lauded the regime’s measures more than once. Still, strong differences remain. TÜSIAD was very clear all through last year that it wanted a return to orthodox neoliberal policies as prescribed by the IMF (austerity, no expansionary fiscal or monetary policies, etc.). While their tone became more cautious in the face of the crisis, their demands have persisted and have sometimes even been voiced by pro-AKP capital groups. The brouhaha over the paper was perhaps the most overt instance of the contradictions of the regime’s crisis management strategy coming into public view. The regime is following a rather unorthodox neoliberal policy, juggling the interests of different capital factions in order to guarantee its own survival. Up to now, all main capitalist factions’ interests have been more or less guaranteed — but it seems unlikely this way of doing things can be kept up much longer. What follows from all of this? Among the diverse factions of the opposition, we are at times confronted with the idea that the economic crisis will almost automatically bring down Erdoğan and the AKP. As long as the economy was “functioning,” the argument goes, the government was able to gain the consent of not only large swaths of the capitalist class, but also parts of the working class and the poor. With the economy in shambles, the AKP’s continued rule has been fatally compromised. And indeed, in opinion polls most people say the “economy/unemployment” is their top priority when thinking about the upcoming contest. Some polls show the AKP’s support down to 35 percent. But this line of argument is wishful thinking. First, the problem is not only the AKP or Erdoğan. Turkey’s problems are structural in nature — features of an economy that has reached an impasse and cannot keep kicking the can down the road. The struggle now is over who is going to pay for the current crisis. And it will be a fierce struggle, along class lines, with or without Erdoğan in power. Second, many people are fed up with the current state of politics, but they have no alternative to embrace. The bourgeois opposition in Turkey is structurally weak, precisely because it does not constitute a real opposition and is mostly itself part of the despotic state tradition and positioned within state apparatuses. The statement “anyone but Erdoğan” is therefore dangerous, defeatist, and born out of desperation. Third, to assume automatic outcomes in complex social situations is not only wrong, it undermines the effort to actively shape political and social change. Opponents of Erdogan can’t sit back and wait for the regime to crumble. We should keep in mind, for instance, that none of the numerous elections since November 2015 have taken place in accordance with even the minimum standards of liberal democracy. So, it’s unlikely the AKP would slink off the stage simply because of an electoral defeat. At best, an electoral defeat could act as an iron bar prying open the contradictions within the regime. The only social force that can turn things around and overcome the structural contradictions of the current crisis is the popular sectors, acting as a relatively independent and empowered subject pushing a revolutionary democratic agenda. For now, such a movement is missing from the political scene. But the structural contradictions that gave rise to the 2013 Gezi Uprising and the subsequent ascent of the HDP are still around, and in fact, with the country’s economic woes, even sharpening.